Governor Christie promises state aid for Thursday's devastating blaze will come in faster than it did for Sandy. The investigation for Thursday’s devastating fire on the Seaside boardwalk is still underway. Investigators are digging through ashes and rubble to find anything that caused the flames which burned through businesses. The ATF currently has 15 structural and electrical engineers focused on finding what caused the fire. Investigators are also looking through the construction records of those buildings rebuilt after Sandy to see if any mistakes were made. "I'm hoping this is going to be better than Sandy," business owner Lucy Santaro told ABC. "Not like Sandy." Many of the business owners on the boardwalk are waiting for the day they can finally re-open again after this second hit they have taken in the last year. New Jersey’s Governor Chris Christie says the state is planning an aggressive response so things can finally get back to normal on the Jersey shore. He promises $15 million from the state for the rebuilding process and says the aid won’t come in as slow as it did for Sandy. "I hope I convinced them, it's part of my reason for being here," Christie said. "But ultimately, they'll be convinced by what we do. And that's always been the test with my administration." 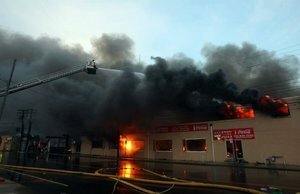 Business owners hurt by the fire will be eligible for $50,000 and $5 million in low-interest loans. The labor department will be on hand next week to help workers who lost their jobs. The fire started Thursday and continued well into the morning. More than 32 buildings recently reconstructed after Hurricane Sandy were damaged by the blaze. During a press conference Governor Christie called the damage “unthinkable.” He vowed businesses would get on their feet just as they did after Superstorm Sandy hit our East Coast in late October last year. Featured Image: A fire still burns as New Jersey Governor Chris Christie addresses the people of Seaside Park in a Press Conference earlier this evening (Photo Credit: Chris Christie’s Facebook Page). Subject: LongIsland.com - Your Name sent you Article details of "Investigators Still Searching for Cause of Boardwalk Fire: Governor Christie Promises $15 Million in Aid"